Our Markilux awnings plus other blinds were all professionally installed, today. The team arrived on time, were very friendly, knowledgeable, and clean and tidy. My wife and I want to record our sincere thanks to you and all your staff, our expectations were truly exceeded. The awning is up and looking great! I just wanted to pass on my thanks to you and all your team — I’ve been so impressed by everyone’s attention to detail and care, every step of the way. Our house was an enormous renovation project, and I can say that nobody I’ve worked with on any aspect of it has shown the patience, skill and pride in what they do as Aquarius have. It’s very unusual to come across — and very, very nice! I’ll be recommending you loudly! Before buying I had loads of questions which I emailed to Aquarius, they answered promptly and when I finally got round to getting them to measure the side office and the snug they had an early evening slot so it was not too inconvenient. The prices were not as cheap as ordering from the internet, but it did mean I did not have to nag a tired husband to fit them (still waiting for Hubby to do the spare room) ordering was easy and small snag (blind for downstairs loo missing top fitting) was fixed the next day. What made me add this comment was that they were so calm and efficient, something I thought was missing from London tradesmen. Just a quick letter, we ordered all the roman blinds for my house from you, the beginning of March and wanted to let you know they all fitted perfectly except the kitchen one which you know about. I was really impressed with how your company reacted when we weren’t 100% happy and the efforts you made to get it right, I suppose that is how you know which are the good guys, I am more than happy for this email to go on your website and you to use me as a testimonial – reference because this is the second time we have used AQ and each time we are getting what we feel is real value for money. I couldn’t get in touch any sooner as I’ve only just got back for the US. Doing up a home sounded like such an adventure to us when we started our project. We quickly learned that the number of options and decisions that are involved can make the design project overly complicated and burdensome. Still we did not want something ordinary and so we relied on Aquarius’ expertise to research our options and focus the suggestions on those that were most appropriate for our home and lifestyle, saving us much time and energy and making the process more enjoyable for us. 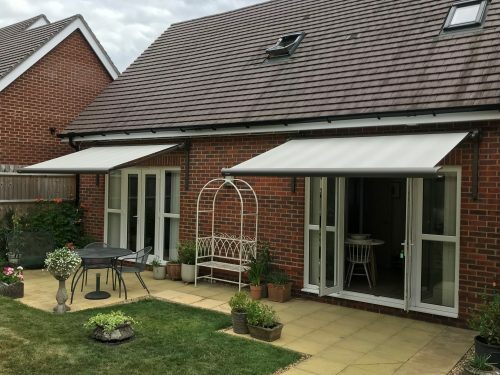 We chose roman blinds from a fabric in your showroom, although the windows were quick large they look so elegant in cream and really set off our pictures as was intended, we were worried about staining and snagging when you use them often, but three weeks later they are good as new. This long and window email is really just a big thank you for putting up with two American amateur interior designers, you did us proud and we will recommend you to all our friends, once we have the rest of house finished. I have been a customer of Aquarius for seven years now and during that time I have had many other companies try to get our business. I would not consider changing. My company managed twelve office blocks in central London and Aquarius Blinds have supplied all of the window shades and blinds for all of them. Every time they are competitive (we get three quotes) and efficient. I have no problem with allowing them access over the weekend to any of the units, knowing full well that nothing will be touched and that I will receive a few thank you emails in the morning. They are a truly professional company and I am happy to be offered as a reference. Incidentally they did the awnings at my daughters school. I found your fitter, Steven (Stefan? ), extremely helpful when he came to my house to measure for fitting and also when choosing the fabrics I preferred. When it came to fitting he arrived on time and completed the job with no mess whatsoever. My only niggle is that we had to leave for half and hour at 11.00 (when I was waiting to go out), however can’t really complain as I was only going to Tescos.